The so-called “lighthouses of the road” were introduced in 1912 – Box no.1 was at Newingreen, near Hythe, Kent – and were originally intended as shelters for passing patrols. Each box was soon equipped with a phone allowing contact with patrols and members to make emergency calls. The wooden structures were also equipped with a fire extinguisher, small fuel supply, first aid equipment, cleaning materials and local information. 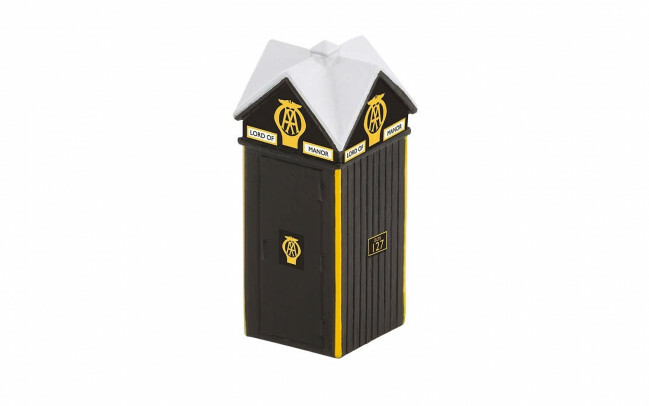 Pack contains one highly detailed AA phone box approximately 38mm high. "Lord of Manor" box number 127.